If you own a travel trailer or motor home, you are probably aware that RV awnings retractable offer a great way to make the most of your campsite by expanding your living space to the outdoors. When your camper has a retractable awning, you can create instant shade just outside your RV's door, no matter where you are camping or how brightly the sun might be shining. 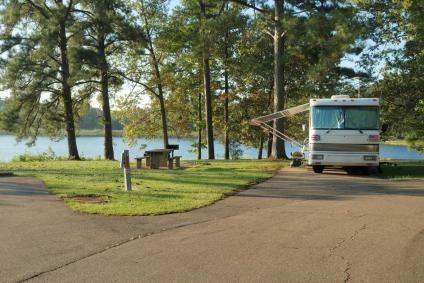 RV awnings consist of a heavy, weather resistant fabric that is connected to a metal frame attached to the camper. RV awnings are connected to the exterior of campers beside their entrance doors. They roll up to fit snugly against the RV during travel and can be expanded to provide a shaded area where you can enjoy sitting and visiting with friends and family members or simply relaxing. Some large recreational vehicles also have smaller awnings installed over the rear and side windows for additional shade. Most, but not all, campers are outfitted with an RV awning from the factory. Awnings can also be added as an aftermarket item. Some RV awnings retractable are motorized, requiring simply the push of a button to be moved in or out. Others are not mechanized and require manual adjustment. Typically, the motorized variety of awning is included with the highest end recreational vehicles while less pricey models come with awnings that must be adjusted manually. While retractable RV awnings can greatly enhance the camping experience, it's important to exercise proper care when using them. When you are camping, pay attention to what the weather is doing before you roll out your retractable awning. If conditions are windy, it's generally best to keep your awning closed. This is because wind can result in serious damage to the frame of a retractable awning. If your awning is out during rainy weather, it's important to allow it to dry fully before rolling it up. If you retract your awning while it is still wet, there is a good chance that mold and mildew will set in while it is closed. If your awning is wet at the end of a camping trip and you have to close it for road travel, be sure to re-open it as soon as you return home or arrive at your next destination to prevent damage. Even if you take good care of them, RV awnings often do not last as long as the recreational vehicles where they are installed. Sometimes the material itself tears, requiring RV awning replacement fabric. In other situations, problems with the frame or retraction mechanisms develop. Some such issues can be handled with a few replacement parts, but often it is necessary to replace the entire awning unit. Replacement awnings are available from companies that sell RV parts and equipment, such as Camping World, RV Awnings Online, and other dealers that cater to the needs of recreational vehicle owners. When you purchase a replacement awning, it's essential that you know the exact measurements of your camper and of the frame for the awning that was originally installed on your unit so you can be certain that you are ordering the correct size. When deciding where to purchase a replacement RV awning, you'll need to consider whether or not you want to try to install the replacement awning yourself or if you want to have it installed by a professional. Installing a retractable awning on a camper can be quite complicated and is a task that is often best left to those with significant RV bodywork experience. If your aren't prepared to tackle the installation yourself, it may be best for you to order the part from a company that provides RV service in addition to awning sales.